Baccarat Double Corona Natural presents sweet, creamy, and woody flavor with a smooth, mellow body in a 7 1/2 x 50 Double Corona vitola. 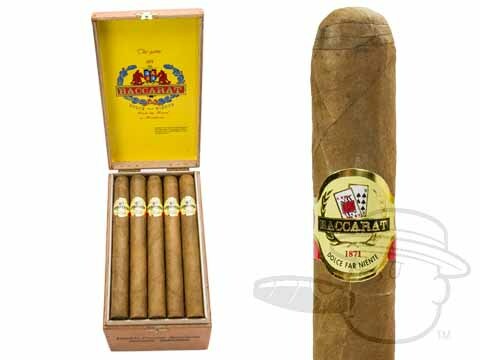 I find Baccarat cigars to be smooth and sweet, mild taste with a touch of coffee flavors. It’s a decent smoke for the money; winner in terms of value. Easy to draw, to burn. I consider them to be an every day cigar. I’m not a cigar aficionado, but I can recognize a quality cigar when I light it / smoke it. Wonderful cigar at a great price. Smooth cigar-great for golf outings. Have always enjoyed the Baccarat brand. Double Corona is a great size for smoking on the golf course. Highly recommend for a mild , enjoyable smoke. This is a smooth cigar if you enjoy the natural wrapper. This is a great cigar that burns smoothly and has a mild flavor. A wonderful cigar for the links - excellent characteristics for golf - long lasting, slow burning, even mild taste. This is a quality cigar with a smooth natural taste. Would definitely recommend. Great cigar, mild in taste and never harsh. Wonderful cigar for the links. These are great smokes for the golf course. A bit larger than my normal Baccarats but with the same smooth taste and good draw. One for the front nine, one for the back nine, and maybe one for the 19th hole. A great cigar for the golf course. Smooth and well made. Scent if much approved by other golfers. I have been smoking these same cigars for 20+ yrs.and will continue to do so, always a pleasure to light up. A very consistent smoke. VALUE not so much...But it is what it is. This is a great value if you like a mild, easy going cigar. Burns a little fast, but always draws easy and consistent good taste. Very popular with me and all my buds! I have been smoking these for the past five years. A friend back in NC turned me onto them. Great medium body smoke at a great price. Baccarat Double Corona Natural is rated 4.7 out of 5 based on 20 customer ratings.